For her ninth cookbook, prominent food writer Anissa Helou could have penned another volume about the flavors of the Mediterranean, the desserts of the Middle East or even the cuisine of Sicily, where she now lives full time in the coastal city of Trapani. But with the arrival in 2010 of the Arab Spring, a popular movement demanding regime change and an end to widespread corruption in a series of countries throughout the Middle East and North Africa, Helou realized she had found her next book’s subject. 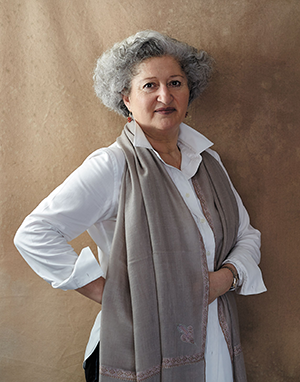 “It came to me that a book on the foods of Islam was more interesting,” Helou said by phone from Trapani, acknowledging that such a focus might court controversy as much as it would slake her intellectual and culinary curiosity. “I wanted to present Islam in a more flattering light. So she embarked on years of travel and exploration to find the connective thread among Islamic food traditions, no small task for a religion with 1.6 billion adherents scattered all over the world. The result is Feast: Food of the Islamic World , a sumptuously photographed, meticulously researched and deeply scholarly love letter to edible Islam. The staggeringly diverse collection of 300 recipes includes savory doughnuts from Zanzibar, biryani from the United Arab Emirates and pasta sauce from Uighurs in Western China. Although the book was inspired by deeply political events—there is even a recipe for koshari, a traditional Egyptian pasta-and-bean dish said to have fed protesters in Tahrir Square who, for weeks, demanded the removal of then-President Hosni Mubarak—Feast is refreshingly devoid of judgment about the writer’s subjects. Helou starts out with a succinct history of Islam, beginning with its birth in the seventh century in what is now Saudi Arabia. Before Islam conquered new lands and converted masses of people, early Muslims—much like the Jews who lived nearby—subsisted on a lot of dates, along with anything they could produce from the cattle they raised. Their food repertoire expanded as they increased their religious and commercial conquests. (Muslims were vital traders along the Silk Road, a lucrative ancient trade route that connected Asia with the Middle East and southern Europe.) With the establishment of the Abbasid Caliphate in Baghdad, the Ottoman Empire in Turkey and the Mughal Empire in Afghanistan came new culinary techniques and traditions. Many foods indigenous to the Arab cultures of the Levant—think pita and eggplant, couscous and tabbouleh—have become part of the Israeli culinary lexicon as well. As with Judaism and Christianity, bread is significant as both symbol and staple in Islam. So sacred is bread that if it is dropped on the ground, forgiveness is asked of God for the transgression. Helou, who has never visited Israel or the Palestinian territories—“it’s on my list as a major gap in my travels,” she said—pointed to another possible connection, noting that the tradition of fasting during the monthlong holiday of Ramadan is one that Muslims most likely adapted from the Jewish tradition of fasting on certain holidays. Ramadan emerges as a powerful theme throughout the book. “At the end of these long fast days, people are serene and calm,” she said. I asked her about her experiences with Muslim women who spent long, hot days preparing festive meals for their families while fasting. To entertain guests for the holidays, try these recipes from Helou’s book. Though The Lord of Stuffed Vegetables, fried whole eggplants filled with lamb and spiced with cinnamon, has roots in Syria, it could just as easily be found on a Jewish table in Israel, especially at Sukkot, when stuffed foods are traditionally prepared. Date ‘Fudge,’ a halva-date confection of Qatari origin, would be wonderful served with a steaming glass of hot mint tea to welcome a sweet new year. The Spicy Baked Fish, cooked in an herbed tahini sauce, calls to mind similar Palestinian and Arab dishes. 2. Make the stuffing: Spread the pine nuts on a nonstick baking sheet and toast in the oven for 5 to 7 minutes, or until golden brown. Keep the oven on, but reduce the temperature to 350°. 3. Melt the margarine in a medium skillet over medium heat. Add the lamb and cook until it loses all traces of pink. Keep mashing and stirring it with a wooden spoon or fork so that it separates well and does not form lumps. Take off the heat. Season with the allspice, cinnamon, pepper and salt to taste. Add the toasted pine nuts and mix well. Taste and adjust the seasoning if necessary. 4. Prepare the eggplants: Trim the stems of the eggplants to about 1/2 inch above the caps, leaving most of the stem on. Peel the eggplants in alternating lengthwise strips about 1/2-inch wide. 5. Pour 2 inches vegetable oil into a large deep skillet and heat over medium heat until hot. Test by dropping a piece of bread in it; if the oil immediately bubbles around it, it is ready. Fry the eggplants until golden all over. Remove with a slotted spoon and drain on several layers of paper towel. 6. Take one eggplant and, with a small knife, slit it lengthwise down the middle—the peeled section will cut more easily—no more than halfway into the flesh. Gently pry the eggplant open and press on the flesh inside to form a pocket in which you will put 1 tablespoon meat stuffing. 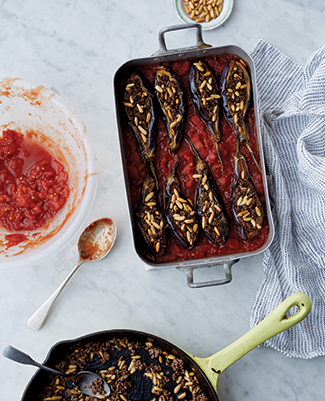 Place in a deep oven-to-table baking dish and fill the rest of the eggplants in the same way. If there is any leftover stuffing, spread it on the bottom of the dish between the eggplants. 7. To make the tomato topping: Season the chopped tomatoes with the allspice, cinnamon, pepper and salt to taste. 8. Spread the tomato sauce evenly over the bottom of the baking dish and in between the eggplants. Bake for 40 minutes, or until the tomatoes have softened and most of their juice has evaporated. Serve hot. 2. Spread the walnuts and almonds on two separate baking sheets and toast in the hot oven for 4 to 5 minutes. Check on the almonds after 3 minutes in case they are coloring too fast. Take out of the oven and let cool. 3. Carefully pit the dates and gently insert a quarter walnut inside each. Press on the ends to close the dates and lay them neatly in a serving dish, leaving a little space between each. 5. Pour this flour halva over and between the dates making sure you fill the gaps. Sprinkle the slivered pistachios and toasted almonds all over. Or you can pour the halva over the serving dish and set the dates into it. Let set. Serve at room temperature. 2. Spread the pine nuts and walnuts on separate nonstick baking sheets and toast in the hot oven for 5 to 6 minutes, or until golden brown. Transfer the pine nuts to a small bowl. Wait until the walnuts have cooled, then chop them coarsely. 3. Put the tahini in a large mixing bowl and add the garlic. Add the lemon juice and start mixing it in. At first you will notice the tahini thickening instead of thinning, but do not worry, it will eventually thin out as you add more liquid. Slowly add 3/4 cup water, stirring all the time until you have a sauce the consistency of heavy cream. Set the tahini sauce aside. 4. Place a large skillet over medium heat and pour in enough vegetable oil to cover the bottom. When the oil is hot, slide the fish fillets into the pan, skin side down, and cook for 3 to 5 minutes, or until the skin is crisp and golden and the fish just done. 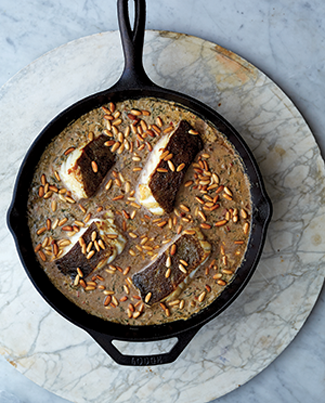 You don’t need to flip the fish as it will finish cooking in the tahini sauce. Transfer to a plate. 5. Wipe the pan clean. Heat the olive oil over medium heat. Add the onion and bell pepper and sauté until the onion is golden and the pepper completely softened, 7 to 10 minutes. Add the cilantro and stir until wilted. Add the ground walnuts, coriander, Aleppo pepper, cumin and salt to taste. Add the tahini sauce and let it bubble gently for 3 to 4 minutes, stirring regularly, until you see a little oil rise to the surface. 6. Slide the cooked fish into the sauce, skin side up, and gently shake the pan to coat the fish with the sauce. Let simmer for a couple of minutes, until the fish has finished cooking. Transfer to a serving platter. Garnish with the toasted pine nuts and serve hot or warm. 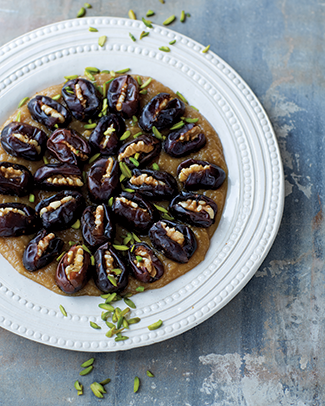 Recipes from ‘Feast: Food of the Islamic World’ by Anissa Helou. Copyright 2018 by Anissa Helou. Excerpted by permission of Ecco, an imprint of HarperCollins Publishers. Photos by Kristin Perers.